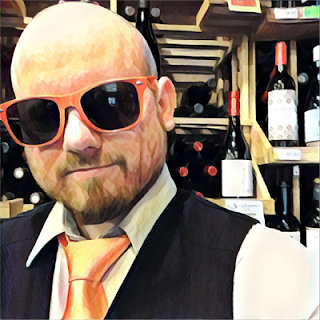 I've already reviewed the Attems Cininis Sauvignon Blanc 2014 so to learn about the winery and how I felt about that wine, feel free to take a look at that review by following this link. 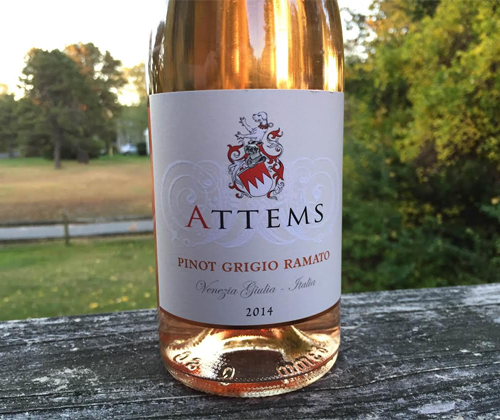 So how does Pinot Grigio get pink? They don't blend in red wine, although I'm sure that's how it's done when somebody like Rex Goliath does it. Pinot Grigio is also known as Pinot Gris, Grigio meaning grey in Italian and Gris meaning grey in France. That's because the grape skins have dark pigment like the grapes that make red wine. Visually you're more likely to get it confused with Cabernet grapes than Chardonnay grapes. But you don't want to make red wine out of it because that would be icky. Red wine gets its color from contact with the dark skins after you squeeze the juice out, while rosé only sees enough contact with its skins to become pink before it's pulled out. However, to officially be called a rosé or rosato or whatever it is in your language, it has to be made from red wine grapes. 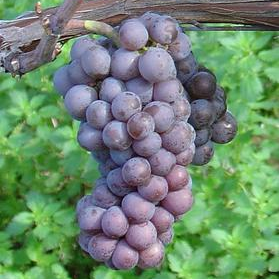 Pinot Grigio is universally considered a white wine grape even with its skin pigment. So what do you do when you let Pinot Grigio keep some skin contact and get some "rosé" color? What do you call it? Attems calls their version Ramato, which translates to coppery. That name is perfect because the wine really is more of a coppery color than pink, much like Villa Wolf's 2014 Pinot Noir Rosé. This wine was fermented in stainless steel and "a part of new oak". 15% was matured in barriques for two months, then four months in stainless steel, blended with the 85% that was matured in only stainless steel for six months, and then all of it spent one month in the bottle before release. It has a 12.5% ABV. On first whiff the aromas of cherries and strawberry punch you right in the nose but once you get past that there's quite a bit of complexity. Orange soda, green tea, salted cashews, lemon zest, onion chives. It's like every time you go to take a closer inspection you pick up another aroma and end up spending more time trying to pinpoint it. In the mouth there's a slight oily mouthfeel, it's medium bodied and has balanced acidity. The flavor is less complex than the nose but the good news is that it's that kiwi-strawberry fruit combo that's always great together, only with a big chunk of lemon added to it. It finishes rindy like you've been chewing on citrus skin. For $19 you can sign me up for this baby any day. Go ahead and pair it with some sashimi and I'll be right over, just tell me when to be there.